As we head toward the end of October, there is a distinct chill in the air, especially during the evenings. Chances are good that you have already powered up your furnace to keep noses and toes warm at night. But before you push your air conditioner to the back of your mind for the winter, it can be worth your while to take a few extra precautions to keep this expensive appliance safe and secure during the cold season. By following these maintenance tips, you can enjoy peace of mind in the spring when you go to turn your air conditioner back on again! Putting your window unit into storage protects the unit itself from damage due to ice, snow, falling tree limbs, and freezing temperatures. Removing the unit permits a more secure window closure to keep outside cold air from leaking in and increasing your heating costs. Unplug the window A/C unit and remove any adhesive sealant. Open the window and remove the unit. Clean and vacuum the outside and inside of the unit and the filter. Store the unit in the original box or a large plastic tub to keep it clean and dry. Place the unit in a warm, dry place indoors during the winter. From here, you can feel confident your window A/C unit will be operational when the warm weather returns next spring. With a ductless air conditioner, you have both an indoor and outdoor component to prepare for the winter season. Here, it is wise to tend to the outdoor component first, since you will want to complete the pre-winter maintenance before it gets too chilly outside! The first thing to do is to turn off the main power source that powers the unit and then the power switch on the unit itself and let the unit cool down. This is for your personal safety. Next, clean the outside casing of the outdoor component. Wipe away any visible dust, debris, dirt, or leaf litter on or around the unit. Clear away all debris and detritus back to four feet on all sides of the unit. Inspect the unit itself for any signs of damage, noting areas of concern. Using a hose with a high-pressure nozzle, clean and hand-dry the coils and condenser. Erect a cover or awning over the outside component, leaving at least one foot of space for air circulation. Head indoors and remove the air filters to clean or replace them. Then inspect the pipes for leaks and dust them to remove dirt or debris. From here, you can continue to check the outdoor component for snow, ice, and storm detritus, keeping it clean and clear. Also be sure to check it before and after any major weather event to avoid preventable unit damage. Unlike with a window unit air conditioner, you can’t just remove your central A/C appliance for storage. But you can prepare it to weather the cold season safely. The first thing you want to do is disable the main electrical circuit that sends power to the air conditioner. This is for your own safety as well as that of the unit itself. 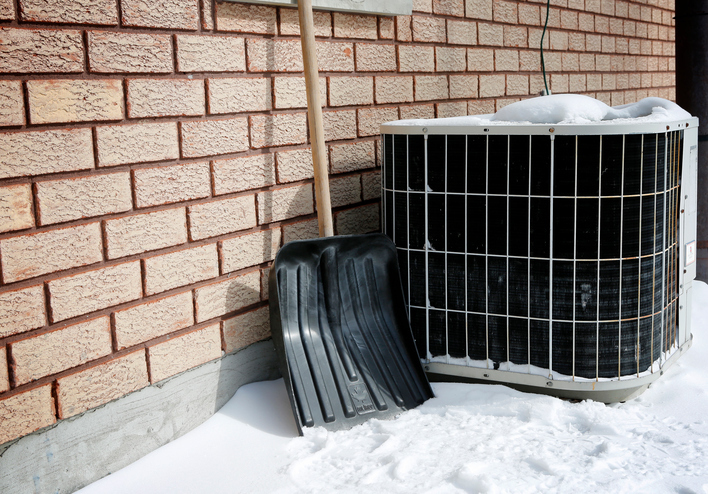 You don’t want your air conditioner to accidentally power up during the winter, which can cause a chain reaction leading to a frozen, inoperable condenser and A/C coils. Wipe down the outside of the air conditioner to remove dust, dirt, and debris. Clear away any ground debris, such as fallen leaves, branches, and trash, that may have accumulated near the base of the unit until there is a clear swath at least four feet wide that surrounds the unit itself. Prune back any greenery that touches or hangs too closely over the unit. Using a hose with a strong pressure nozzle, clean the condenser coils, fan blades, and other visible areas where dirt or debris may have accumulated. Give your air conditioner a thorough visual inspection, carefully noting any dents, cracks, or other signs of damage. Make a list of any areas of concern. Put up some kind of cover or awning over the unit that can protect it from falling debris or heavy snowfall. Be sure to leave at least one foot of space at the top and on all sides to allow for air circulation and avoid mould growth. You will want to continue to check on the AC unit during the winter, and especially just before and after major weather events. Continue to clear away debris and inspect the unit itself for signs of damage. Did you know Shipton’s offers a wonderful suite of time and money-saving annual protection and maintenance plans? These handy plans help you control and lock in prices, redeem discounts, plan ahead for major life cycle repairs, and earn valuable rewards toward future repairs and maintenance needs. Best of all, you no longer have to remember to call and schedule your annual service, because we will call to remind you and schedule a good time! We have plans suitable for all levels of HVAC maintenance, inspection, and repair needs. 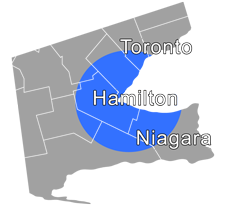 Here at Shipton’s, we have been proudly serving the Hamilton and surrounding areas for nearly 100 years. Give us a call at 905-549-4616 to learn more.